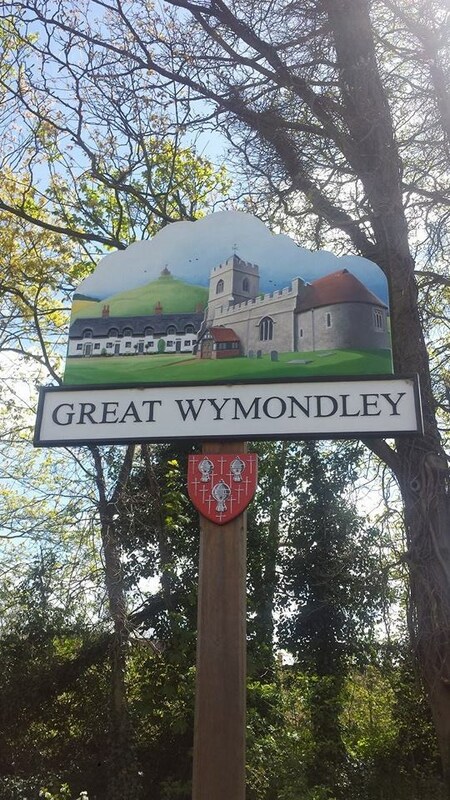 The parish of Great Wymondley has an area of 1,490 acres, of which 1,397¾ acres are arable land, 348¾ acres permanent grass and 92 acres wood. Two portions of the parish are detached. The first portion, lying a mile south of Great Wymondley proper and separated from it by Little Wymondley, contains the hamlet of Titmore Green, which lies between Redcoats Green and Todd's Green, each of which gives its name to a few cottages. The second detached portion lies still further south, on the borders of Stevenage parish, and has no houses within its area, but contains part of Lucas's Wood. The elevation of the parish in the east is between 300 ft. and 400 ft., but it slopes downwards towards the River Purwell on the western boundary. This river turns the mill of the same name which was leased by the lord of the manor of Great Wymondley from Hitchin. Near to the mill the foundations of a Roman house were found in 1884. A little distance from the boundary, in a meadow beside the road from Hitchin, are the 'Nine Springs ' from which rises a brook flowing into the Purwell. The cache is not at the village sign due to it being too close to a traditional cache right opposite the sign! To find the cache look at the postbox at the listed coordinates. What is the last two digits of the postbox number? This is AB. What hour is the Monday to Friday collection time? This is C.